If your message is in two parts, or you want to add your logo to the sign, a split sign may be just the ticket. Let us help you organize your parking with these free, printable signs. These flexible, rubber wheels stops are a great choice for almost any parking lot. This set of 6 cones, plus the chains and connectors, provides a cheap and easy way to quickly mark a barrier that will catch everyone's attention. In this video, we'll help you navigate the rules for van accessible parking spaces. Why should you buy from MyParkingSign.com? No Parking, No Stopping or No Standing? This video will help you figure out which of these signs to use. How Big Should My Sign Be? Bigger the sign, better the visibility. This quick video tell you how. Learn why our high durability custom metal signs outlast competition. Let us take you through the simple, step-by-step customization process. A quick review of parking lot directional signs. If my car is damaged in a parking lot, who is responsible? This new pictogram suggest the coming trend: redefining accessibility signs. We're here to help you figure out exactly what signs you need to be safe and compliant. These simple signs can be used alone or with a regular-sized sign for emphasis. Personalize a blank sign with dry erase markers or adhesive letters. POF laminate keeps your sign as good as new for years! Take a look. Reflective Designer Signs provide high visibility in dimly lit areas and add a designer touch to your premises. Watch this video for a quick demo of the features. Designer Palladio signs now have a reflective option, which makes them much easier to see in a low-light situation. When your need to change your message from time to time, here are some temporary options. Which Reflective Grade is Best from My Parking Sign? Make your sign visible, day or night. Choose Engineer, High-Intensity, or Diamond Grade. Watch this video to understand why 63 Mil Aluminum Signs are preferred by professionals. Here are the features of 80 Mil Aluminum signs. Sophisticated Designer Signs not only look great, but offer high durability also. Watch this short video for more. Play this quick video to see how our 63 mil Engineer Grade Aluminum Signs are better than the rest available in the industry. What makes our 80 Mil Engineer Grade Aluminum Signs the best in industry? This video has the answer! A quick demonstration of Dry Erase Aluminum Signs with writable space. Take a look. 63 Mil High Intensity Aluminum Signs offer great durability and easy installation with pre drilled holes. Watch this video for more. 80 Mil High Intensity Grade Aluminum Signs offer high visibility, rounded-injury free edges and more. This quick video details out its features. Palladio Signs are an excellent combination of sturdiness and sophistication. This quick video details out the features of this product. Signs made of diamond grade aluminum are light weight and last longer. This quick video lists out some more features. Watch the video that demonstrates strength and durability of 80 Mil Diamond Grade Aluminum Signs. Fluorescent Yellow Green Diamond Grade Reflective Aluminum can be seen from afar. This video will tell you more. This video will show you why Engineer Grade Retrofit Labels are an amazing buy for interior as well as exterior use. Watch this 40 second video for a closer look on our durable and affordable Plastic Signs. These screen printed polyethylene signs are made of high-grade plastic and are extremely lightweight. This quick demo details the other features. Simply slip the pre-notched Cone Top Sign down the aperture of a traffic, safety or construction cone. This quick video tells you how these Reusable Polyethylene Stencils are great money-savers and can be used thousands of times to display the same message many times over. IceAlert signs let you know when the temperature drops below freezing. An inexpensive yet sturdy sign base. This is a heavy sign base, which will stand up to wind, water and the elements. This is the heavier of our cast iron options. This is the larger version of the Tip 'n' Roll Sign base, but still simple to set up and move around. With feet that extend, this sign stand is ingeniously designed to be incredibly stable. A safe, secure way to attach your sign to its post. Installing post with breakaway hardware could potentially save you thousands of dollars. Pre-notched sign slides down the top of a flexible and portable cone which can be lifted up and placed at any location. A simpl, effective, and inexpensive way to install a sign on a chain link fence. Resists the windiest of the weather.Flexible X-Tube Parking Lot Sign System—durable and lightweight. FlexPost Signposts bend, preventing damage to the car and to the sign. The Flexpost XL is the next generation flexible signpost that features a concealed spring that is stronger, more durable and aesthetically pleasing than the original. This is everything you'll need to attach a sign on virtually any post. This is our standard kit of bolts, nuts and washers. Check out this quick instructional video on how to replace worn out or broken springs on any traditional Flexpost model. IceAlert Indicators are the rugged, reliable, and cost-effective solution to your winter woes! It's not as hard as you think to install your own plastic sign post. With over 50 LED light on each side, this is the brightest Stop Sign Paddle on the market. Let people know that illegal parking in your lot will not be tolerated. These panels draw can be used on their own, or in conjunction with a standard sign. Our destinctive signature design, with the added reflectivity feature. A great combination of sturdiness and portability. Click here to learn more about your options for portable sign bases. It's surprisingly easy to install a sign these steel bands, and a few turns of a screw. Tough disposable signs, that are easy to install. The portable Tip 'n' Roll sign bases has integrated wheels that allows to move the setup in an easy way. We've got the best quality cones at the best price. With the base, the post, and two signs, this kit is ready to use in a few minutes. Some hints and tips for installing a U-Channel post. It's not as tough as you think. Our sidewalk signs are smartly designed so they're easy to move, easy to customize, and really tough to knock over. Consider attaching two shorter posts instead of the hassel of installing one very tall post. This quick video answers some frequently asked questions about installing U-Channel Posts. Learn why our durable Stop/Slow Paddles are so easy to handle. Everything you need to install a sign in one box. How to assemble and install a Stop Sign in minutes. Heavy, yet easy to roll into place. Made in the USA from recycled tires. 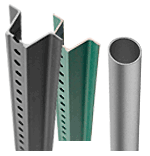 Lighter and stronger than traditional steel posts, the Flexible Post system doesn't break and withstands abuse. Take a virtual tour in this video! Flexpost are built with durable, long-lasting materials to withstand the elements, collisions, corrosion and more. But don't take our word for it, click on the video and see for yourself! The Flexible Mailbox Post instantly rebounds to the full upright position upon impact with little to no damage to both your mailbox and the colliding vehicle. Check out our field tested Flex Bollards that are guaranteed to rebound upright automatically upon impact. A simple and inexpensive way to install a sign in a minute. The simplest sign is often the best option. A video to inform you about every aspect of our premier quality reserved parking signs. We have the best quality, the best customer service, and the best price on the web. What is the best way to organize your parking and keep violators away? Watch this video to know the specifications of this Authorized Parking Only Violators Are Subject To Towing At Owner's Expense Sign made from rust free aluminum. See this sign in action. Compare reflective sign grades. Custom and stock signs to help boost bicycle safety. Our signs are made with top-of-the-line materials. One sign can make all the difference. There are lots of specifics required by the State of California. We're here to help. Examine every detail before buying this Charging Station Electric Car Parking Only While Charging Sign. Watch this video to learn why our church signs are unbeatable. Learn more about sign that prohibits parking in the fire lane. This video lists out features of Colorado Fire Lane Sign. Compare reflective grades and learn more about important parking sign features. We have the best quality, the best customer service, and the best price on the web.We have the best quality, the best customer service, and the best price on the web. It doesn't cost anything extra to personalize your parking signs. Take a look! Polite “Please” still works! Learn more about this sign’s features. Learn more about this sign and the different reflective options. Check out the features of our durable, effective, and premium quality DO Not Enter Signs here. These simple reminders could be life-changing. For private driveways, and other non-public areas, we've got the signs you need. Know all about electric vehicle parking signs in this video. Want to purchase an employee parking sign? This video offers detailed description of Employee Parking Only Sign. In a variety of materials, take a look at our Enter and Entrance signs. Special events need special signs. Here is a quick demo of our Fire Lane Signs with no parking symbol. Don’t jeopardize everyone’s safety. Take a close up view of this popular fire lane sign. Compare reflective grades of signs. Learn about how many sign you need for your fire lane. Funny Signs will get people's attention! All our signs are made with the highest quality materials and are built to last. See why we're the best on the web. Durable products at low prices, sold by our stellar customer support team. Here is a clear explanation of our distinct parking only handicapped sign. Include an accessible parking sign with an ISA to reserve the spots. Watching this short video will help you make an informed decision before buying the Handicapped Parking Signs. Learn more about handicapped parking sign through this video. Everything you need to keep your hotel parking orgnaized. See what makes these signs the favorite of desgin-savvy property owners. Explore different grades of reflectivity. Keep deliveries moving . Get a quick look at our popular loading zone signs. These signs are a simple safety reminder. Low-Emitting and Fuel Efficient Vehicles Parking Only Sign comes with round-injury free corners and pre drilled holes for easy installation. Get a detailed overview in this video. Check out the features of our Motorcycle Parking Only Sign in this video. All of our Reserved Parking Signs meet MUTCD standards. Learn about different reflective grades and see No Overnight signs in action. Compare grades of reflectivity. See this sign in action. What grade of reflectivity is best is best for you? Learn more about these important no parking signs. Take a closer look at our durable, best-selling signs. 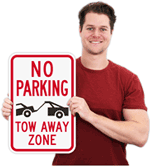 Check out specifications on our No Parking Do Not Block Driveway Tow Zone Signs. Learn more about No Parking Fire Lane Keep Clear At All Times Sign before you order one. Featuring the best quality, great customer service, and lowest prices on the web. Compare materials and see this sign in action. Take a look at the best No Parking sign from every angle. We want you to have the best. Choose a high-quality no parking sign for your property. Learn more about the resilient features of our aluminum No Parking Signs. Keep traffic moving with one of our No Stopping signs. When should you use these signs? Also learn more about different reflective grades. See why our not responsible for theft signs are so resilient and popular. This Park At Your Own Risk Sign comes with three grades of reflectivity, quick installation process, and more. Find out in this quick video. An innovative approach to share all the details about the parking signs. Encourage safety with a sign like this. With a variety of shapes, sizes and materials, we have exactly the sign you need to tell people that your lot is full. These are our signs designed to help direct people toward their best parking options. Make an informed choice. Watch this video for detailed information about signs that say parking permit only. These smaller signs work great with larger signs, or on their own. Prevent illegal parking, even during the night. Learn the detailed product specifications of this Penalty Tow-Away Zone (handicapped symbol) Sign in this quick video. Find out why our premier quality parking permit signs are the best! Simplify your pick up and drop off system with clear signage. Simple and effective signs will keep people off of your property. See these sign up close. Learn more about reflective grades. This compact video lists out all the characteristics of private property-no parking sign. Quality speaks for itself. Watch this video to have a better knowledge about the reserved for employee of the month sign. Compare features and sizes for accessible signage. 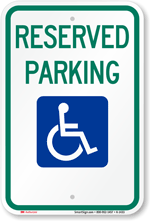 Get a detailed overview of signs for reserved parking and handicapped plate permit only. Organize your parking lot with our high-quality, parking signs. Want to know why our reserved parking signs stand out? Play this video. Want to purchase a resident parking sign? This video will help you make the right choice. Check out the material specs and other features of our Speed Limit Signs here. We've been making signs longer than anyone in the country, becasue we deliver the best. Add specificity to your sign with a supplemental sign. This video makes you available a brief and precise description of the tenant parking sign. Compare quality and learn about different grades of reflectivity. Avoid the tow truck, with one of these signs. Customize your sign to establish the rules... and the consequences. We have hundreds of signs to help you keep organized. We carry the right design and the right material for any aesthetic. For details on van accessible handicapped signs, watch this video. Great prices, superb quality, and the best customer service in the business. See Tow Away signs in action. Compare reflective sign grades. Quick 2 minute video explains why our Welcome Visitor Parking Sign effective, cost-efficient, and durable. Our Yield Signs not only comply with DOT standards, but come with several other features as well. Check out this video for more.